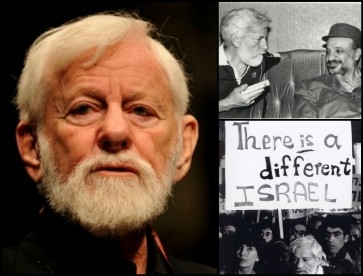 Uri Avnery's unwavering belief in Palestinian openness to the two-state solution over the years exemplifies Albert Einstein's famous definition of insanity: doing the same thing over and over again and expecting different results. I never thought I would concur with anything written by veteran Israeli "peace" activist Uri Avnery, but I find myself in full agreement with his recent prognosis that "sheer stupidity plays a major role in the history of nations" and that the longstanding rejection of the two-state solution has been nothing short of grand idiocy. But it is here that our consensus ends. For rather than look at the historical record of the Palestinian-Israeli conflict and draw the self-evident conclusions, Avnery retreats into the counterfactual fantasyland in which he has been living for decades. "When I pointed this out [i.e., the two-state solution], right after the 1948 war," he writes, "I was more or less alone. Now this is a worldwide consensus, everywhere except in Israel." Ignoring the vainglorious (mis)appropriation of the two-state solution by the then 25-year-old Avnery, this assertion is not only unfounded but the inverse of the truth. Far from being averse to the idea, the Zionist leadership accepted the two-state solution as early as 1937 when it was first raised by a British commission of inquiry headed by Lord Peel. And while this acceptance was somewhat half-hearted given that the proposed Jewish state occupied a mere 15% of the mandate territory west of the Jordan river, it was the Zionist leadership that 10 years later spearheaded the international campaign for the two-state solution that culminated in the UN partition resolution of November 1947. Five successive Israeli prime ministers have unequivocally endorsed the two-state solution. Likewise, since the onset of the Oslo process in September 1993, five successive Israeli prime ministers – Shimon Peres, Ehud Barak, Ariel Sharon, Ehud Olmert and Benjamin Netanyahu – have openly and unequivocally endorsed the two-state solution. Paradoxically it was Yitzhak Rabin, posthumously glorified as a tireless "soldier of peace," who envisaged a Palestinian "entity short of a state that will independently run the lives of the Palestinians under its control," while Netanyahu, whom Avnery berates for rejecting the two-state solution, has repeatedly proclaimed his support for the idea, including in a high-profile 2011 address to both houses of the US Congress. By contrast, the Palestinian Arab leadership, as well the neighboring Arab states have invariably rejected the two-state solution from the start. The July 1937 Peel Committee report led to the intensification of mass violence, begun the previous year and curtailed for the duration of the commission's deliberations, while the November 1947 partition resolution triggered an immediate outburst of Palestinian-Arab violence, followed six months later by an all-Arab attempt to destroy the newly proclaimed State of Israel. Nor was the Palestine Liberation Organization (PLO), established in 1964 at the initiative of Egypt's president Gamal Abdel Nasser and designated by the Arab League in 1974 as the "sole legitimate representative" of the Palestinian people, more receptive to the idea. Its hallowed founding document, the Palestinian Covenant, adopted upon its formation and revised four years later to reflect the organization's growing militancy, has far less to say about Palestinian statehood than about the need to destroy Israel. In June 1974, the PLO diversified the means used to this end by adopting the "phased strategy," which authorized it to seize whatever territory Israel was prepared or compelled to cede and use it as a springboard for further territorial gains until achieving, in its phrase, the "complete liberation of Palestine." Five years later, when president Carter attempted to bring the Palestinians into the Egyptian-Israeli peace negotiations, he ran into the brick wall of rejectionism. "This is a lousy deal," PLO chairman Yasser Arafat told the American Edward Said, who had passed him the administration's offer. "We want Palestine. We're not interested in bits of Palestine. We don't want to negotiate with the Israelis. We're going to fight." 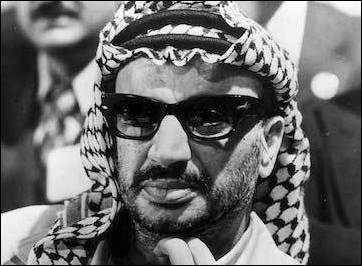 Even as he shook prime minister Rabin's hand on the White House lawn on September 13, 1993, Arafat was assuring the Palestinians in a pre-recorded Arabic-language message that the agreement was merely an implementation of the PLO's phased strategy. Yasser Arafat spoke the language of peace to Western audiences, while portraying a prospective settlement with Israel to his constituents as a transient arrangement driven by the needs of the moment. During the next 11 years, until his death in November 2004, Arafat played an intricate game of Jekyll and Hyde, speaking the language of peace to Israeli and Western audiences while depicting the Oslo accords to his subjects as transient arrangements required by the needs of the moment. He made constant allusions to the phased strategy and the Treaty of Hudaibiya – signed by Muhammad with the people of Mecca in 628 CE, only to be disavowed a couple of years later when the situation shifted in the prophet's favor. He insisted on the "right of return," the standard Palestinian/Arab euphemism for Israel's destruction through demographic subversion; he failed to abolish the numerous clauses in the Palestinian Covenant that promulgated Israel's destruction; and he indoctrinated his Palestinian subjects with virulent hatred toward their "peace partners" and their claim to statehood through a sustained campaign of racial and political incitement unparalleled in scope and intensity since Nazi Germany. He didn't stop at incitement, either – he built an extensive terrorist infrastructure in the territories under his control and, eventually, resorted to outright mass violence, first in September 1996 to discredit the newly elected Netanyahu and then in September 2000, shortly after being offered Palestinian statehood by Netanyahu's successor, Ehud Barak, with the launch of his terror war (euphemized as the "al-Aksa Intifada") – the bloodiest and most destructive confrontation between Israelis and Palestinians since 1948. This rejectionist approach was fully sustained by Arafat's successor, Mahmoud Abbas, who has had no qualms about reiterating the vilest antisemitic calumnies and has vowed time and again never to accept the idea of Jewish statehood. At the November 2007 US-sponsored Annapolis peace conference he rejected prime minister Olmert's proposal for the creation of a Palestinian state in virtually the entire West Bank and Gaza that would recognize Israel as a Jewish state. 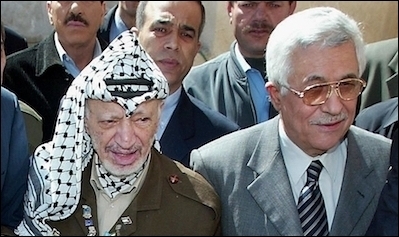 Arafat's successor, Mahmoud Abbas (right), has vowed time and again never to accept the idea of Jewish statehood. When in June 2009 Netanyahu broke with Likud's ideological precept and agreed to the establishment of a Palestinian state provided it recognized Israel's Jewish nature, PLO chief peace negotiator Saeb Erekat warned that "not in a thousand years will Netanyahu find a single Palestinian who would agree to the conditions stipulated in his speech," while Fatah, the PLO's largest constituent organization and Abbas's alma mater, reaffirmed its longstanding commitment to the "armed struggle" as a strategy, not tactic, "...until the Zionist entity is eliminated and Palestine is liberated." As late as November 2017 Abbas demanded that the British government apologize for the 1917 Balfour Declaration – the first great-power public acceptance of the Jewish right to national self-determination. Can this 80-year-long recalcitrance be considered outright, unadulterated idiocy? It most certainly can. Had the Palestinians accepted the two-state solution in the 1930s or 1940s, they would have had their independent state over a substantial part of mandate Palestine by 1948, if not a decade earlier, and would have been spared the traumatic experience of dispersal and exile. Palestinian leaders have repeatedly rejected the path to peace, reconciliation, and statehood. Had Arafat set the PLO on the path to peace and reconciliation instead of turning it into one of the most murderous and corrupt terrorist organizations in modern times, a Palestinian state could have been established in the late 1960s or the early 1970s; in 1979, as a corollary to the Egyptian-Israeli peace treaty; by May 1999, as part of the Oslo process; or at the very latest, with the Camp David summit of July 2000. Had Abbas abandoned his predecessors' rejectionist path, a Palestinian state could have been established after the Annapolis summit, or during Barack Obama's presidency. Avnery's failure to see this stark historical record for what it is, and his unwavering belief in Palestinian openness to the two-state solution, may not qualify as idiocy, yet surely conforms to Albert Einstein's famous definition of insanity: doing the same thing over and over again and expecting different results. Efraim Karsh is emeritus professor of Middle East and Mediterranean studies at Kings College London, a senior research associate at the Begin-Sadat Center for Strategic Studies, principal research fellow at the Middle East Forum, and editor of its flagship journal, Middle East Quarterly.